NO PURCHASE NECESSARY TO ENTER OR WIN THIS CONTEST. A PURCHASE WILL NOT INCREASE YOUR CHANCES OF WINNING. 1. SPONSOR & ADMINISTRATOR: Subway Franchisee Advertising Fund Trust Ltd. (“SFAFT”) on behalf of Market #067-0 will serve as the sponsor (“Sponsor”) of the 2019 Market #067-0 “Standout Coach” Contest (the “Contest”). WSLS, LLC will serve as the administrator (“Administrator”) of the Contest. 2. MARKET #067-0: Market #067-0 shall consist solely of the Roanoke-Lynchburg counties in Virginia. 3. ELIGIBILITY: In order to qualify to submit an Entry (defined herein) to the Contest, you must be a legal resident of Market #067-0 and 18 years of age or older at the time of entry. Each Nominated Coach (defined below) must be 18 years of age or older at the time of their nomination, a registered volunteer coach of a youth sporting program on or before April 22, 2019 in Market #067-0, and remain such a coach during the entire Contest Period (defined below). Employees (and their immediate families or those living in the same household) of Sponsor, Administrator, Doctor’s Associates LLC, Franchise World Headquarters, LLC, Subway IP LLC, SubwayÒ Restaurants, SubwayÒ Franchisees and their respective affiliates, subsidiaries, divisions, parent and related companies, suppliers, printers and advertising, promotional and judging agencies are not eligible to enter or win. An “Entrant” is an eligible person who submits an Entry in accordance with these Official Rules. 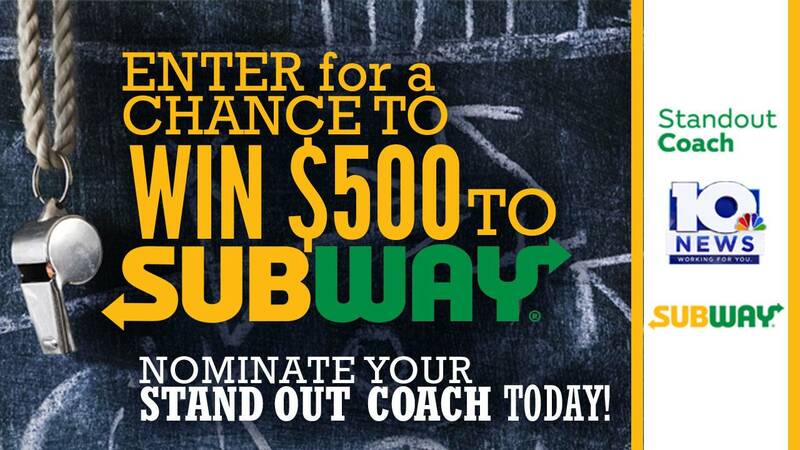 All Subway® standout coach contest grand prize winners from previous contest periods are ineligible. 4. CONTEST PERIOD: The Contest begins April 22, 2019, 10:00 a.m., EDT, and ends May 19, 2019, 11:59 p.m., EDT (the “Contest Period”). 5. HOW TO ENTER: Eligible Entrants may submit an Entry to the Contest by visiting www.wsls.com (the “Website”) during the Contest Period, clicking on the “Subway®” graphic to access the online application to nominate a coach, completing the online application, including the coach’s first and last name (each a “Nominated Coach”), the Nominated Coach’s address, e-mail address, birth date and phone number, the youth team name of the Nominated Coach, the league name, the county, city and state where the Nominated Coach’s team is located, your first and last name, your address, your e-mail address, your birth date, your phone number and a paragraph describing why your Nominated Coach deserves to be the Contest winner (“Nomination Description”), and clicking the checkbox that you agree to the Official Rules (the Nomination Description along with the other information previously provided is collectively referred to as the “Entry” or “Nomination”). By submitting an Entry to the Contest, Entrants fully and unconditionally agree to be bound by these Official Rules and the decisions of the judges, the Committee (defined below), and the Administrator, which will be final and binding in all matters relating to the Contest. Eligible Entrants must continue to comply with all terms and conditions of these Official Rules throughout the Contest Period. Failure to abide by all terms and conditions of these Official Rules throughout the Contest Period may result in disqualification. Nomination Descriptions must be in words and may not contain URLs/links, must be in English, may not exceed two-hundred fifty (250) words and may not contain any of the following words, phrases, or combination of words or phrases: travel ball, elite coach, select coach, showcase coach or camp coach. Limit to one (1) Entry per Entrant/email address (as documented on the records of the applicable email service provider). Any person, who is found to have entered more than the stated limit, in the sole discretion of Administrator, may be disqualified and all Entries received from such person during the Contest Period will be judged void and disqualified. No Entries may be received before or after the Contest Period. Entries that are late, lost, illegible, mechanically reproduced, contain false information, damaged, misdirected, mutilated, garbled or incomplete, altered, contain disparaging or inappropriate information, or otherwise irregular in the sole discretion of Administrator, that have been submitted or generated using robotic, programmed, script, or any other automated means, or illicit means, or do not conform with or satisfy any or all of the conditions set out in the Official Rules, as determined by Administrator in its sole and absolute discretion, may be judged void and disqualified. All Entries become the property of Sponsor and Administrator and in no case shall be returned to the eligible Entrant. By submitting an Entry to the Contest, each eligible Entrant warrants and represents the following with respect to their Nomination, including the Nomination Description: (a) Entrant is the sole and exclusive owner of the Nomination; (b) the Nomination is Entrant’s own creation and is 100% original; (c) the Nomination does not violate or infringe on any rights of any third party; (d) any third party whose person or property is referenced in the Nomination has given Entrant appropriate written consent (which shall be provided to Sponsor upon request thereof) for such person or property to be referenced in the Nomination and used by Sponsor as set forth herein these Official Rules; (e) Nominated Coach has consented to his or her Nomination; and (f) the Nomination does not contain any false, inaccurate or misleading material, does not violate any law or regulation, is not libelous, threatening or harassing, does not instigate others to commit illegal activities, does not contain any obscene, offensive or illicit content, and does not contain any viruses, worms, or other computer programming intended to or that could interfere with the ability of others to enjoy the Website. By entering the Contest via Nomination, Entrant automatically grants to Released Parties (as defined herein) a worldwide, exclusive, royalty-free, irrevocable license to use, copy, publicly display, distribute, alter, and create derivative works from the Nomination, including the Nomination Description, in all forms of media now known or not currently known, in any language, throughout the world, and in any manner, for trade, advertising, promotional, commercial, or any other purposes without further review, notice, approval, consideration, or compensation, except where prohibited by law. Sponsor and/or Administrator reserves the right to reject any Entry, to modify, edit, or remove any Entry from the Website or to request an Entrant to modify his/her Entry if, in the sole opinion of Sponsor and/or Administrator acting in its sole and absolute discretion, the Entry does not abide by these Official Rules or is otherwise inappropriate, or could potentially expose Sponsor and/or Administrator to law suits, embarrassment, adverse publicity or otherwise reflect unfavorably on Sponsor and/or Administrator. 6. PRIZES AND APPROXIMATE RETAIL VALUE: There will be one (1) grand prize (the “Grand Prize”), awarded to one (1) Nominated Coach (the “Grand Prize Coach”) during the Contest Period. The Grand Prize consists solely of one (1) five-hundred dollar ($500) Subway® gift card and Subway® catering for the Grand Prize Coach’s team up to a total value of two-hundred and fifty dollars ($250) (the “Coach Grand Prize”). There will be four (4) first place prizes (the “Coach First Place Prize” and collectively with Coach Grand Prize, a “Prize”), awarded to four (4) Nominated Coaches (the “First Place Prize Coaches” and collectively with the Grand Prize Coach, the “Winners”) during the Contest Period. The Coach First Place Prize consists solely of one (1) one-hundred dollar ($100) Subway® gift card. Total approximate retail value (“ARV”) for all Prizes is $1,150. d. Overall promotion of a healthy lifestyle to youth (25%). There will be one (1) Nominated Coach selected as the winner of the Coach Grand Prize and four (4) Nominated Coaches selected as the winners of the Coach First Place Prize by the Committee, in its sole discretion, on or about June 2, 2019 from among all Entries received during the Contest Period. The Grand Prize Coach and the First Place Prize Coaches must pass all required background check requirements, as determined in the sole and absolute discretion of Sponsor, and be in good standing with their league and an active volunteer during the entire Contest Period. Administrator will use reasonable efforts to contact the Winners within one (1) week after the determination of the Administrator that the Grand Prize Coach and the First Place Prize Coaches are entitled to Prizes under these Official Rules. If a potential winning Grand Prize Coach or First Place Prize Coach does not respond to initial notification attempt within 48 hours, such person will forfeit the applicable Prize and Administrator may select an alternative Winner in accordance with the criteria set forth above. The Winners must pick up his or her prize at WSLS, 821 5th Street NE, Roanoke, VA 24016 during normal business hours no later than June 7, 2019, and present an acceptable form of photo identification. Winners are subject to verification by Administrator of name, age, address, phone number, and other information as Administrator deems necessary, in its sole discretion. The Winners must be verified as a coach in good standing with the applicable youth sporting league and with a background check on file with the applicable league along with any additional state clearances, a copy of which may be required by Administrator, within 48 hours of being notified as a Winner, or the Prize for the Winner may be forfeited and may be awarded to an alternate in accordance with the above judging criteria and at Administrator’s sole discretion. 8. PRIZE CONDITIONS: No substitution for any Prize will be permitted. If necessary due to unavailability of the Prize, a prize of equal or greater value will be awarded at the discretion of the Sponsor. Prize is not transferable, assignable or redeemable for cash. Entrants, Nominated Coaches, and Winners may be required to execute and return an Affidavit of Eligibility and Publicity/Liability Release, and an IRS W-9 form (i.e. Request for Taxpayer Identification Number and Certification) within fifteen (15) days of issuance by Sponsor. Failure to return all required documents in this time period may result in the Winner being disqualified and an alternate Winner selected. If a prize notification is returned to Sponsor as undeliverable or if an Entrant is found to be ineligible or a Nominated Coach declines to accept a Prize for any reason, an alternate Winner will be selected. By entering this Contest and/or accepting the Prize, Winner and Entrant hereby consent (except where prohibited by law) to the reasonable use by Sponsor of the Winners’ and Entrants’ photograph, voice, likeness and/or image, hometown address, contents of the entry form and the name and age of the Winners and Entrants without any further compensation for any future promotional activity related to this Contest. All federal, state, local tax liabilities and any applicable fees associated with accepting a Prize or participation in this Contest are the sole responsibility of the Winners. If a Winner declines a Prize, or if an Entrant or Nominated Coach has not complied with these Official Rules, such person shall be disqualified and another person will be chosen in in accordance with the above judging criteria for the Prize. No transfer, substitution, division or splitting of Prizes allowed. Acceptance of a Prize constitutes permission by an Entrant or Nominated Coach to the Sponsor and/or Administrator and their agencies to use Entrant’s or Nominated Coach’s names and/or likenesses for purposes of advertising and trade without further compensation, in perpetuity and in any and all media now known or hereafter discovered, unless prohibited by law. Decisions of Sponsor and/or Administrator are final with respect to determination of Winners and all matters with respect to the conduct of the Contest. By participating in this Program, Entrants and Winners agree to be bound by the Official Rules. 11. LIMITATIONS OF LIABILITY: Released Parties (as defined herein) are not responsible for any incorrect or inaccurate entry or entries, errors in calculations, theft, tampering, destruction, or unauthorized access to, or alteration of entries; printing or other errors; and any entries or mail which are late, lost, delayed, incomplete, misdirected, stolen, mutilated, illegible, postage due or any combination thereof. Sponsor reserves the right to modify, suspend or terminate the Contest in the event that it becomes necessary due to circumstances beyond Sponsor’s control. In the event the Contest is terminated early, Winners will be selected from all eligible Entries received at the time of termination. 12. RELEASE OF LIABILITY: By participating, Winners, Nominated Coaches, and Entrants (and the parent or legal guardian thereof if a Winner, Nominated Coach, or Entrant is deemed a minor in his/her state of residence) agree to release, discharge, indemnify and hold harmless Sponsor, Administrator, Doctor’s Associates LLC, Franchise World Headquarters, LLC, Subway IP LLC, SubwayÒ Restaurants, SubwayÒ Franchisees, and each of their respective affiliated entities, affiliates, subsidiaries, parent corporations and companies, and all of their respective officers, directors, shareholders and principals, employees, representatives, agents and franchisees (collectively, “Released Parties”), from and against any claims made by any Winners, Nominated Coaches, and Entrants or any other third parties related in any way to the operation of this Contest, as well as any other claims, damages or liability due to any injuries, damages or losses (whether alleged, threatened, or actual) to any person (including death) or property of any kind resulting in whole or in part, directly or indirectly, from participation in this Contest or any related activity. Winners, Nominated Coaches, and Entrants (and the parent or legal guardian thereof if the Winner, Nominated Coach, or Entrant is deemed a minor in his/her state of residence) assumes all liability for any injury or damage caused, or claimed to be caused, by participation in this Contest or acceptance, use or redemption of any Prize. 13. PRIVACY / USE OF PERSONAL INFORMATION: By participating in the Contest, eligible Entrant hereby consents to Sponsor’s, Administrator’s or authorized agents’ collection, use, and disclosure of Entrants’ personal information for the purposes of administering the Contest and prize fulfillment. Each Entrant acknowledges that he/she has read, understood and accepted the Sponsor’s Privacy Statement, which provides more information about Sponsor’s privacy practices and is located at https://www.subway.com/en-us/legal/privacystatement-fwh. Entrants may be offered the optional opportunity to receive coupons, newsletters, informational materials, marketing communications, or other special promotions, or other offers from Sponsor, affiliates within the Subway® Group, and/or third-party service providers. Entrants will not be contacted for marketing purposes unless they have provided their express consent. By accepting a Prize, each recipient of a Prize agrees to Sponsor’s and Administrator’s use of his/her name, city/province of residence, picture, biographical information, statements, voice and likeness in any advertising and publicity Sponsor, Administrator, and their respective successors, assigns and licensees may conduct relating to the Contest in any media or format, whether now known or hereafter developed, including but not limited to the Internet, at any time or times in perpetuity, without further compensation or notice, and hereby releases Released Parties from any liability with respect thereto. Recipients of the Prizes may be required to sign a further release regarding the grant of these publicity rights. 15. WINNERS LIST AND OFFICIAL RULES: You may obtain copies of the Official Rules or a list of Winners by sending a self-addressed, stamped envelope that reads: Winners List – or – Official Rules, WSLS, 821 5th Street NE, Roanoke, VA 24016, Attn: Subway Standout Coach Contest; all requests must be received within six (6) months after the end of the Contest Period. Administrator may post the Official Rules on its website for a limited period of time: http://www.wsls.com. Ó2019 SubwayÒ is a Registered Trademark of Subway IP LLC. ©Subway IP LLC. All rights reserved. Abbreviated Rules. NO PURCHASE NECESSARY. To participate, you must be a legal resident of Market #067-0 and 18 years of age or older at the time of entry. Nominations limited to eligible coaches in Market #067-0. Contest begins April 22, 2019, and ends on May 19, 2019. Eligible coaches 18 years of age and older may be entitled to receipt of certain Prizes. For complete details see Official Rules available at: http://www.wsls.com. Sponsor: Subway Franchisee Advertising Fund Trust Ltd. (“SFAFT”) on behalf of Market #067-0.